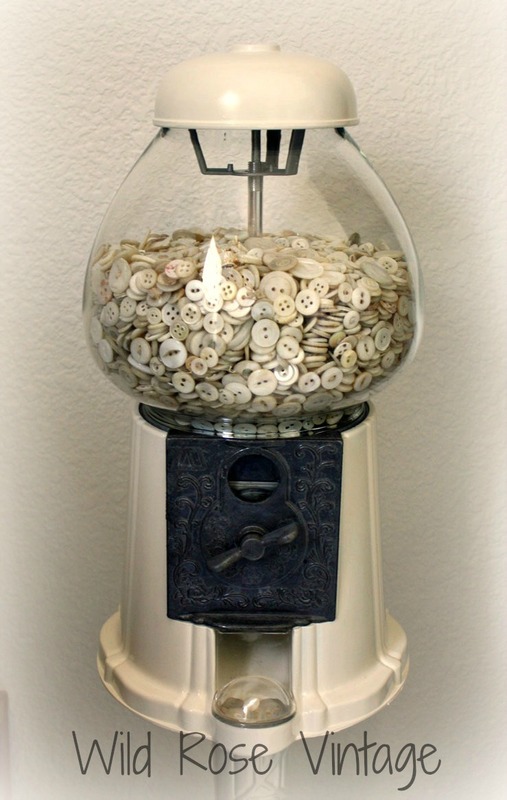 This is something I have wanted to do for a couple of years, take an old gumball machine and fill it with mother of pearl buttons. I got out the cans of spray paint Sunday and painted this and one other project I'll save for next week (when I'm finished with it) I used Rust-oleum Canvas White because I like the shade of white so well, it looks like whipping cream, about the same shade as the mother of pearl buttons. My sewing room still needs some work and most of all a new floor. We're thinking of using strips of plywood to resemble planking in this house but first we'll see if we continue to like them in the bunkhouse this summer. I just had to take another picture of my favorite thing in this room, I added the strings of pearls and that just made it even better. The gumball machine before. I found it out on a junking trip last summer with Deb from Garage Sale Gal for $15! I was so thrilled to find it! Oh my...I love it! I have always thought old gumball machines were so neat. Now, even more so! I want one for my craft room. Your room is just gorgeous! Love it filled with buttons. Mine is filled with old marbles!!! 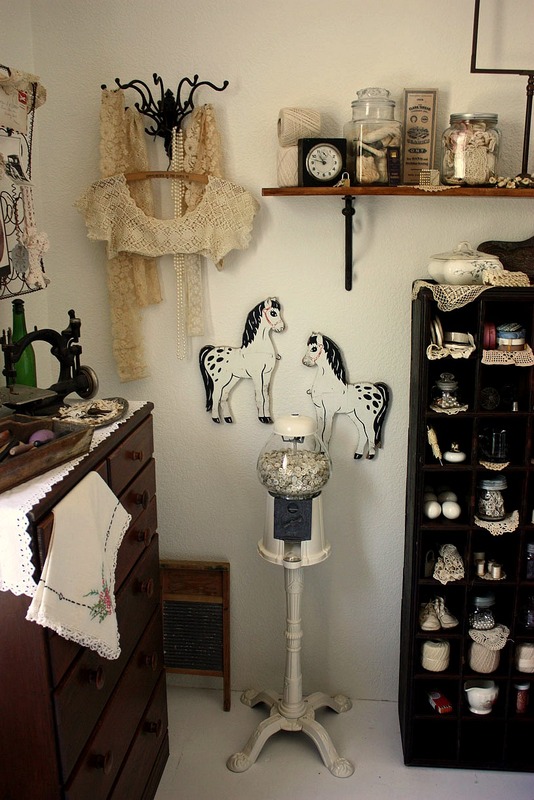 Your room is so nice and filled with so many great treasures! I love your old gumball machine. It looks so nice now. That is a great color, it shows off how pretty the base is, too. 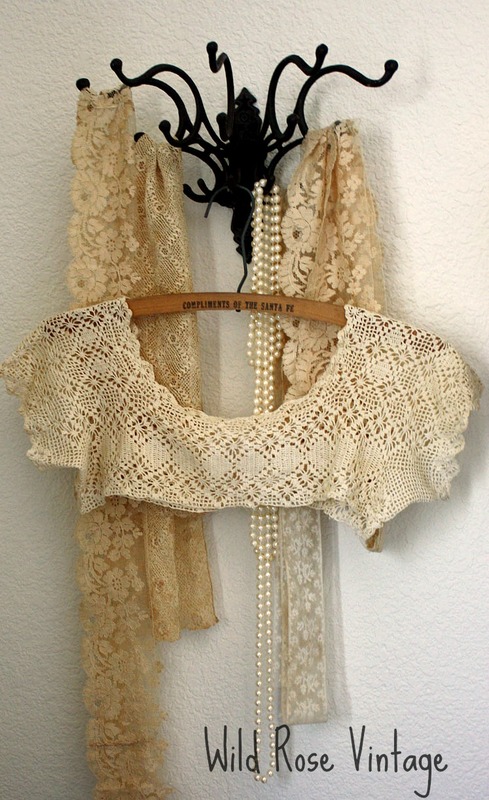 The long strings of pearls look fantastic with the lace on that fancy hook. OMGosh Faye, that came out sooo cute! I've always wanted a gumball machine of my own. I never thought of filling it with buttons, though. I could just see one of these filled with all kinds of vintage buttons in an Antique Mall. I know I'd be lining up to see what treasures I could get. I love it! This is something I've been thinking about, but just need to find the gumball machine. Love the soft white and all the pretty buttons. I'm eyeing all the other beautiful treasures in your room too. Thanks for sharing at Vintage Inspiration Party. How fun, Faye...I love how the gumball machine looks filled with the pretty buttons! What a great idea! I never thought about doing that with the buttons. I have more buttons than I can ever use. Now to look for a gumball machine....I will add it to my list!! Your room looks so warm and cozy and creative. Oh, no, I just passed up a gumball machine at the thrift shop last weekend. I think it was $6. Wonder if it's still there??? ?